illiards and bladdamasta’s weekend in the wilderness was not completely spent scale rocky outcrops and a journey to Rylstone was called for to collect supplies and refreshments. Rylstone is 240kms North West of Sydney and has preserved the look of 1800s NSW town. It’s done a pretty good job of building itself into a tourist destination both for the town itself and the access it gives to the Wollemi National Park, Dunns Swamp and Ferntree Gully. There’s 10 different places for a feed including the bistros/restaurants of the two fine pubs that still exist in Rylstone. It might be a short pub crawl, but it’s one well worth doing. As we were accompanied by kids, we weren’t able to linger at either establishment, but both provided facilities that at least able to blow the froth of one schooner without being too pestered. 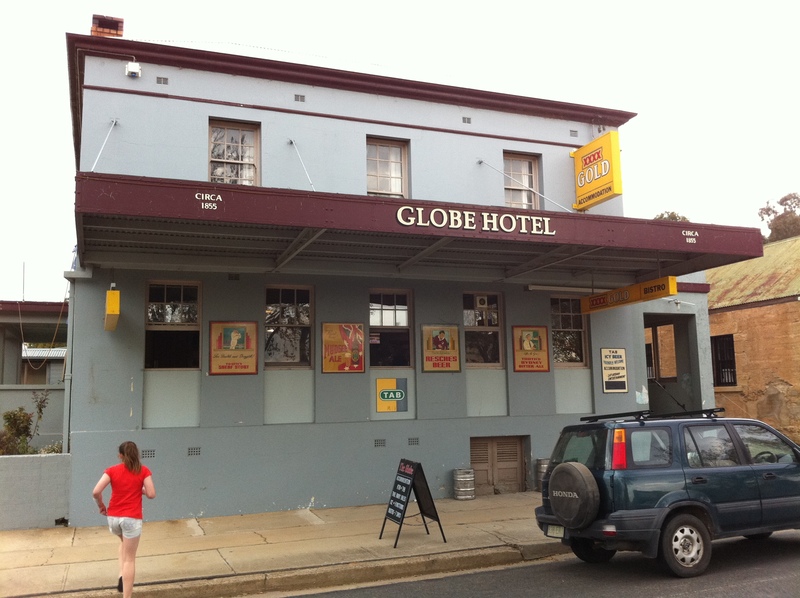 The Globe Hotel claims to be around since 1855, which is quite possible given Rylstone has been around since the 1840’s. There’s a main bar and a very smart separate bistro called the Shed. Enjoying a schooner with the sprogs is easy with an expansive beer garden that surrounds the bistro. 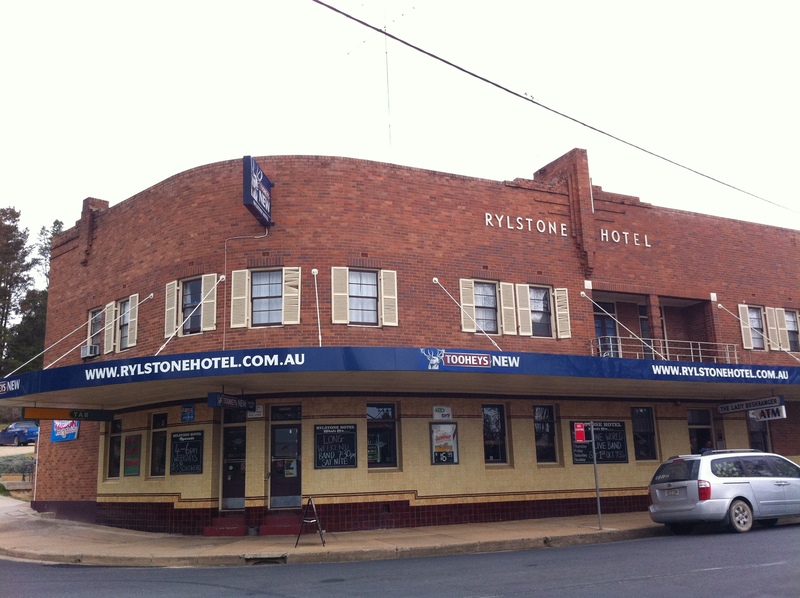 A 100m crawl brings you to the more modern Rylstone Hotel. This place has had a fair bit of coin dropped on it recently. The front bar is relatively small, but there are expansive areas out the back. There’s been extensive landscaping and the creation of a very impressive beer garden. For a couple of blokes with a tribe the discovery is a very large trampoline at the side of the hotel. This wouldn’t pass muster in Sydney – not because it wasn’t fun or wouldn’t keep the kids amused for hours – but simply because I haven’t seen a trampoline without side netting this century. 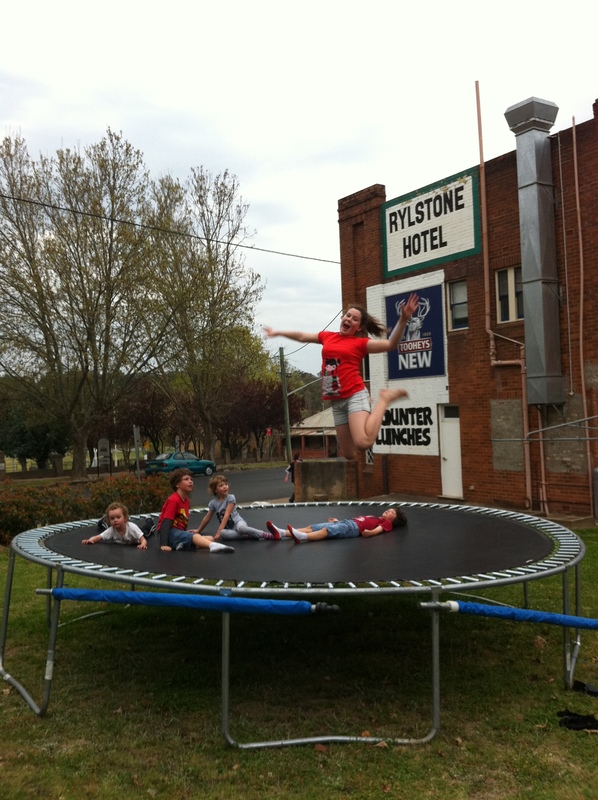 The Rylstone is backing the theory that a higher protects drunks and kids – this trampoline is evidence of that. A great child-minding facility. 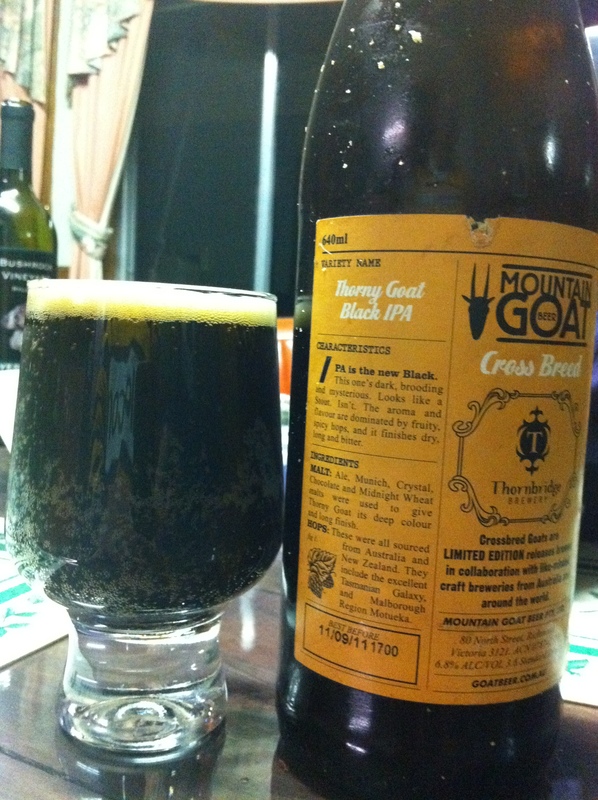 The beer we had upon our return home was a rare concoction that involved two brewers – Thornbridge Brewery of Derbyshire, England and Mountain Goat of Richmond, Victoria, Australia. 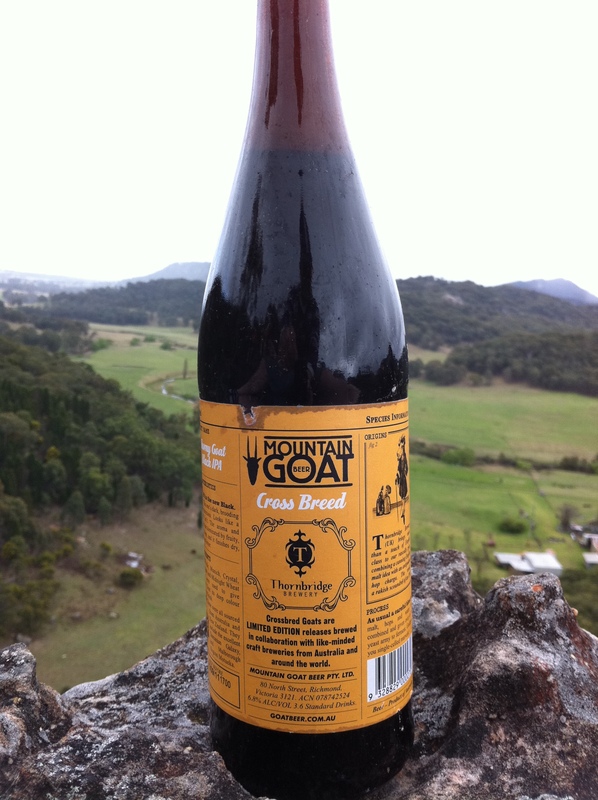 The guys from Mountain Goat love making one-offs and have started an occasional series of collaborations that they call their Cross Breed beers. This one came out in March 2011, and I was very forunate to uncover a single bottle in the back of a fridge at Porters Balgowlah. It is an optical illusion of a beer because it is so black, you’d be forgiven for thinking that you are drinking a Stout. In fact, it is a Black IPA. It was a wonderful mix of hoppiness and chocolate malts and even though it had the long bitterness of a great IPA, there was a real maltiness lurking as well. I look forward to more Cross Breeds.